Dolinina Antonina Fedorovna – MD, Head of the neurological department. Address: Blyukhera, 42-A, Chelyabinsk, 454092, Russia. Gromova Liliya Leonidovna – MD, PhD, Department of Nervous Diseases. Address: st. Vorovskogo, 64,Chelyabinsk, 454092,Russia. 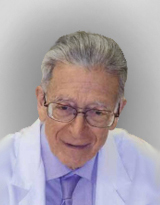 Mukhin Konstantin Yur'evich – Ph.D., professor, head. Address: st. Borisovskie prudy, 13,Moscow, 115211,Russia.